I am speaking at QCon in London this week. The official details for my session are here. 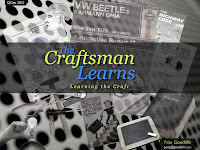 My talk is entitled: The Craftsman Learns (or Learning the Craft) and it's going to be both practical and a great deal of fun. We'll investigate why software developers learn, what software developers (should) learn, and some keys that will help us to learn more effectively. Useful stuff for any programmer who cares about their craft. I'll be there and I'm really looking forward to it. Are you around for the rest of the conference too? Sweet. I'm hanging around Weds/Thurs.